A couple days ago was July 1st (Canada Day) and tomorrow will be July 4th (Independence Day in the US), so I thought I'd take some time to go over some really lovely books by a variety of First Nations and Native American authors and illustrators, as now is as good a time as any throughout the year to remember that the history of these two nations spans farther back than we often acknowledge, and that we, as educators for peace, and hopefully as just decent humans, should spend far more time than we do bringing authentic Indigenous voices and representations into our classrooms and homes. Remember that Indigenous culture is not monolith; seek out representations from a variety of tribes; find out about the land your class is on, and the languages spoken in your region; support Indigenous artisans and respect Indigenous storytellers. Invite elders to your classroom. And easiest of all- bring in books. Here are some of my favourites. We'll start with one of the best books I've read, and one that's wrenching and beautiful and lovely- "Shi-shi-etko" by Nicola I. Campbell, an Interior Salish and Métis author. The new standard by which all children's books about the residential school system in Canada will be judged (a government program that lasted over one hundred years and removed approximately 30% of Indigenous children from their families and placed them in schools where they were forbidden from speaking their own languages; practicing their own religions; and attempted to 'take the Indian out of the child' and assimilate them into the dominant Canadian culture), "Shi-shi-etko" follows one young girl in the days before she is taken away for her first year at the school. She spends time exploring and remembering her home and the nature that surrounds her, with her parents and grandmother giving her stories and memories to hold onto while she is away. The story touches on the residential school system in a way that is accessible and understandable for very young children (I have read this in my preschool class) without going into the horrors that occurred. Everyone who teaches (particularly in Canada, but variations of the school system occurred in other countries, including the US and Australia) should have this book in their library. After writing "Shi-shi-etko" and its sequel "Shin-Chi's Canoe", Nicola I. Campbell's latest book is much happier and a lovely example of a book that features First Nations children just being children- always important. "Grandpa's Girls" is a charming story based on her own childhood memories of visiting her grandfather's farm in the summer. I love it not only for it's representation of children being children- exploring, playing, running through fields, sneaking candy- but also for including grandparents, which is surprisingly rare in children's literature. This intergenerational story is delightful and definitely not as heavy as her previous works. 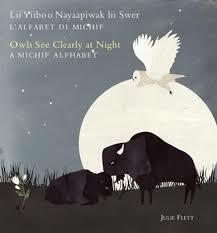 "Owls See Clearly at Night" by Métis author and illustrator Julie Flett is a spare and minimalist alphabet book, featuring words from the Michif language- the language of the Métis people. Michif combines Cree and French, and the language is disappearing. Flett's illustrations depict not only things recognizably First Nations- like bannock or moccasins- but also things such as the word for 'he/she is picking berries' and 'water'. It's a beautiful collection. (Some of Flett's other gorgeous works include two of my favourite board books for Noora- "My Heart Fills With Happiness" and "Little You", both of which she illustrated). "The First Strawberries: A Cherokee Story" by award-winning Abenaki storyteller Joseph Bruchac, is a lovely version of the Cherokee legend explaining how strawberries came to be in the world. There's not much to say about it- it's short, beautiful, and sweet and has been read and re-read in my classroom for years (this is actually my second copy of it, the first, like a later book on this list, wore out from enthusiastic and enchanted young readers). 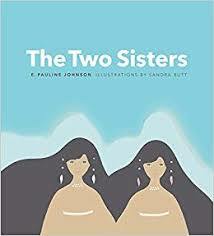 "The Two Sisters" by Mohawk and English-Canadian poet Pauline Johnson is lovingly revamped and modernly illustrated for a new generation. Johnson, an iconic Canadian poet and writer originally published this story (told to her by Squamish Chief Joe Capilano) in a book called "Legends of Vancouver" in 1911. This is the first time the story has been published on its own and illustrated. It describes the creation of the Two Sisters, known colloquially in Vancouver as the lions, the mountains on the North Shore overlooking the city of Vancouver. A unique, and gorgeous pastel palette bring the creation story to life. This beautiful book is a must for Canadian classrooms, especially for those in BC. (It only appears to be available in the Canadian Amazon, and I have yet to find it in the US). "The Elders Are Watching" by poet David Bouchard and illustrated by famed First Nations artist Roy Henry Vickers is an absolutely stunning plea to readers to be careful of our environment, and to protect it. Vickers, who has Haida, Heiltsuk, and Tsimshian ancestry, has a unique style incorporating different elements from the artistic traditions of his mixed heritage. The message of the book is just as relevant today as it was when originally published, and it has been a favourite in classrooms across the world. I can't recommend it highly enough. "Alego" by Inuit artist and author Ningeokuluk Teevee is a charming tale of a girl and her grandmother going to the beach and digging for clams and searching tidal pools for animals. Children are always intrigued by the idea that the far north has starfish and tidal pools like we have down south, and the pencil illustrations are unique and pretty. The book is told in both English and Inuktitut- an official language of the Canadian territory of Nunavut, and spoken throughout the entire northern part of the country. This small book is a sweet introduction to life up north. 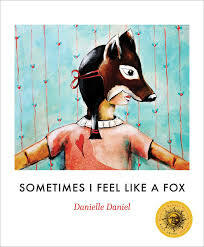 "Sometimes I Feel Like A Fox" by Métis artist Danielle Daniel is perfect. The story originally came to be as a series of paintings Daniel did to help her child connect to his roots, the book introduces children to the Anishinaabe tradition of totem animals. Each animal is depicted as a child in costume and has a short description. There is an author's note at the back explaining the tradition of totem animals and the significance of them. The book is absolutely enchanting and every person I've given it to- child or adult- has loved it. "Thirteen Moons on Turtle's Back: A Native American Year of Moons" by celebrated and award winning Indigenous author Joseph Bruchac (of "The First Strawberries" fame) and Jonathan London, is the other book that I have had to replace in my classroom from being over-loved. A collection of poems, each one focusing on a different moon and it's name and meaning to a particular tribe. Following the cycle of a year, the poems are lovely, and it's rare to find a book that incorporates so many different tribes (including Lakota Sioux, Menominee, Huron, Northern Cheyenne and more) while making it clear that each are separate and distinct. It's beautiful, and the painted illustrations are as well. A classic (and for damn good reason), "Thirteen Moons on Turtle's Back" is a must for any classroom. What are some of your favourite Indigenous books for children?